Cancellation of Removal, often referred to as cancellation, is an available defense for both lawful permanent residents (“LPR”) and non-residents in removal proceedings. Cancellation of removal is an attractive form of relief for permanent residents because it restores their resident status if granted. It is attractive to nonresidents because it confers lawful permanent resident status if granted. The eligibility requirements and bars to applying for cancellation of removal differ for lawful permanent residents and nonresidents. It is highly recommended to consult an experienced immigration attorney when preparing a cancellation defense. Are you a lawful permanent resident facing removal from the United States? The attorneys at The Law Office of Kathryn N. Karam, P.C. represent clients facing deportation in communities throughout Harris County, Montgomery County, Brazoria County, Fort Bend County, and Galveston County. 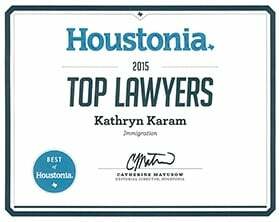 Houston immigration attorney Kathryn Karam is Board Certified in Immigration and Nationality Law by the Texas Board of Legal Specialization. You can have her review your case and help you understand your legal options by calling (832) 582-0620 right now to take advantage of a confidential attorney consultation. What are the eligibility requirements for Cancellation of Removal for permanent residents? How do I satisfy the continuous residence requirement? What supporting documentation must I include in the application for relief? Where can I learn more about Cancellation of Removal for lawful permanent residents? If you are a permanent resident facing deportation in removal proceedings and you are seeking relief through Cancellation of Removal, you must file the appropriate application with the immigration court hearing your case. Lawful permanent resident respondents and nonresident respondents must file different applications when applying for cancellation of removal. Although the determination of 42-A Cancellation of Removal appears to be straightforward, there exists many complex rules regarding the “seven years continuous residence” requirement and which crimes are considered an aggravated felony. It is imperative to consult an experienced attorney to assist in the determination of cancellation eligibility. In addition, the balance of positive factors in a person’s case (family ties in the United States, positive work history, community involvement, or other favorable factors) versus negative ones (criminal history or immigration violations) is weighed by an immigration judge, and an experienced immigration attorney can help you prepare your best case. To qualify for 42-A Cancellation of Removal, the applicant must have seven years continuous residence in the United States. The applicant must accrue these seven years before the “stop-time rule” is triggered. The Notice to Appear or NTA is the document issued by the Department of Homeland Security (“DHS”). The document contains the government’s allegations and charges of inadmissibility or deportable. Accrual of continuous residence stops on the date on the NTA not the date of the respondent’s initial appearance before the immigration judge. The stop-time rule is also triggered by the commission of a crime referred to in INA §212(a) (2). These commonly include crimes related to controlled substances and crimes involving moral turpitude. It is important to consult a skilled immigration attorney, to ensure a criminal conviction does not eliminate 42-A cancellation eligibility. With your 42-A Cancellation of Removal, you must include evidence to prove that you meet of all eligibility requirements. The list below provides examples of some of this documentation but it is not exhaustive. If you are applying for LPR Cancellation, you should provide documentation regarding criminal history, including police clearance, police reports, court judgment, and any relevant documentation. The applicant must show the court he or she has not committed an aggravated felony or any criminal offense that precludes 42-A eligibility. An experienced attorney can provide guidance regarding your particular case. You should consult an immigration attorney for the supporting documentation needed based on your unique circumstances. 7-Year Cancellation of Removal| NLADA— The National Legal Aid and Defender Association provides a quick guide to determine Cancellation of Removal eligibility. If you or a loved one is facing removal from the United States, it is in your best interest to have legal counsel. The Law Office of Kathryn N. Karam, P.C. represents clients in around the Greater Houston area, including Sugar Land, Pasadena, Magnolia, Cypress, League City, The Woodlands, Bellaire, Conroe, and Pearland. Harris County immigration attorney Kathryn Karam specializes in Immigration and Nationality Law, and she exclusively handles immigration matters. Call (832) 582-0620 today to schedule a confidential consultation that will let her review your case.